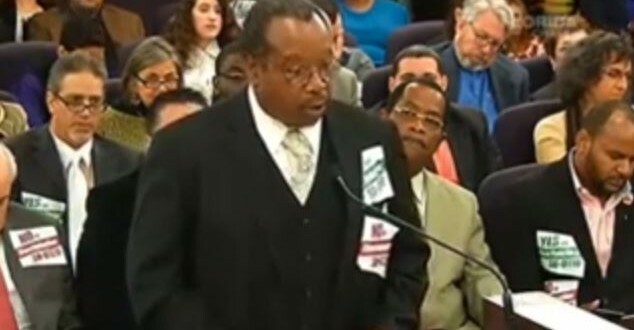 FLORIDA: Pastor Tells Senate Committee That Gays Are Killers And Therefore Deserve No Rights [VIDEO] - Joe.My.God. The Florida Senate Judiciary Committee today postponed until next week its hearing on SB 120, a comprehensive LGBT anti-discrimination bill. The committee ran out of time because it first heard public comments on SB 110, which as written would allow businesses to refuse to serve LGBT customers. Speaking in support of the bill were a slew of haters and alleged ex-gays, including a local pastor who recounted the 2008 murder of a Fort Lauderdale high school student by her childhood friend. According to the pastor, the slain girl “was not of a homosexual nature” and was killed when the other girl’s advances were rejected. The pastor went on to claim that homosexual potential killers are stalking Christian children in the hallways of schools all over Florida. “They are very forceful and they are very demanding towards those of a Godly nature,” he declared. Watch below. By a 7-3 vote down party lines SB 110 was approved for advancement to the full Senate.